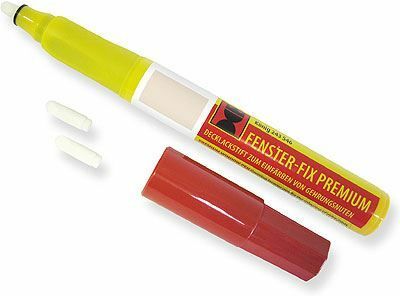 Product information "Cream Konig Kanten-Fix Plus Touch-Up Repair Pen"
Quick and even colouring of mitre grooves, corners and edges during PVCu window manufacture and touch-up of corners, cut marks and scratches in damaged Cream White PVCu window profile and doors. Following table shows Renolit/Cova foiled uPVC colour codes that are compatible with this pen. Related links to "Cream Konig Kanten-Fix Plus Touch-Up Repair Pen"
Customer review for "Cream Konig Kanten-Fix Plus Touch-Up Repair Pen"